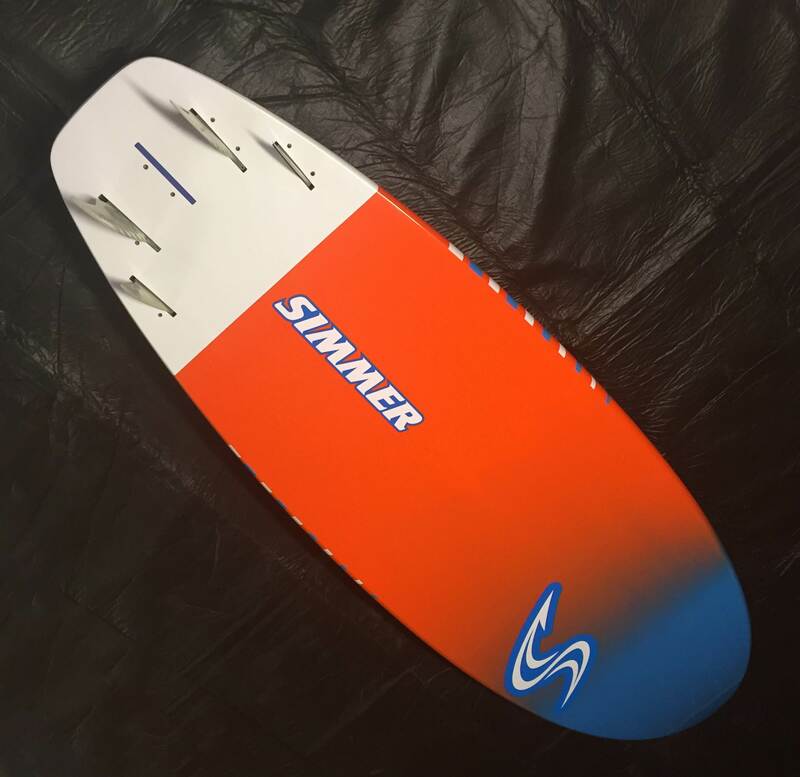 I've picked up myself the new Simmer Style Freegal 110 for my light wind board for this season, It's a compact wave design (As compact as a 110 can be I guess) similar to the Starboard Reactor or Quatro Super Mini. The board is quite short at 219cm but makes up for that in width at 66cm wide, I've had wide wave boards before (Quatro 110 & OES 127 Custom HotRod) and found they work quite well in the less the ideal conditions we get at Gerroa most of the time (It's not always awesome DTL). The board itself is immaculately finished, The paint job is nothing less then pure perfection..And quite bright I might add. The standard footstraps feel comfortable and held in place with double screws which means they are super secure and the pads feel nice under foot. 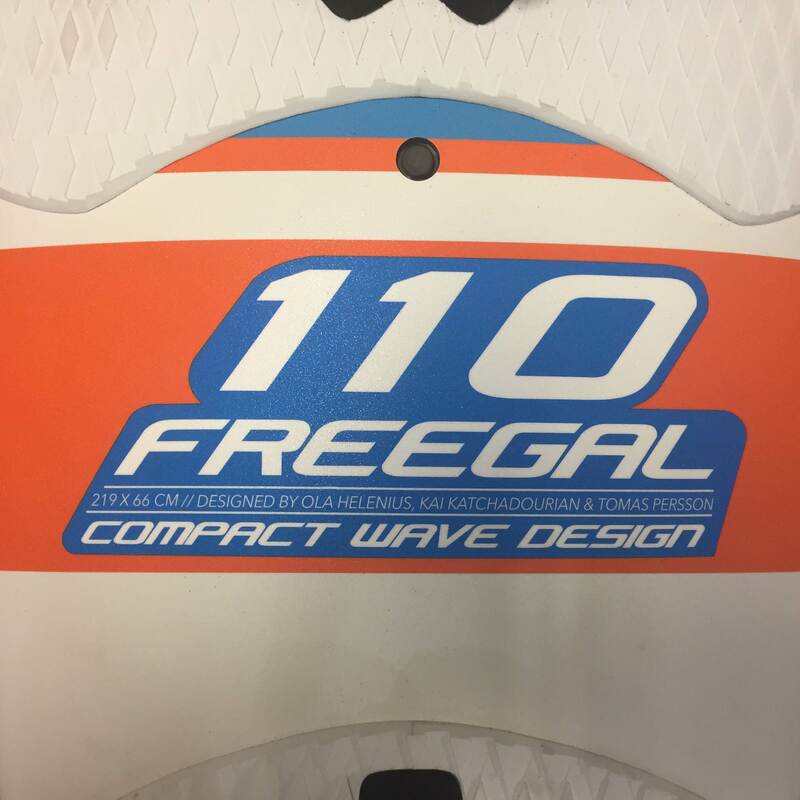 "The Freegal is a reduced length wave board, combining the speed of a fast tail rocker flow with the radical performance of a compact tail. Freegal is a versatile board which can be tuned to perform well in all conditions from onshore wind waves to down the line ground swell type conditions. It is inspired from recent developments in the surfing world and it provides quick adaptation between different turning styles. Riding a Freegal helps the sailor to utilize every part of the wave. The Freegal thrives under the feet of an active sailor who pushes the turns and looks for vertical sections on the wave. It responds very sensitively to the riders input but still handles a powerful turn. The combination of low drag and tight turning performance makes the Freegal unusually good when chosen in larger than normal sizes for sailing when the wind and waves are less powerful. As such, it is an excellent choice as a float and ride complement to a smaller wave board. It also performs in standard sizes as an energetic all rounder." 5 slot boxes for total versatility, Suits any rider preference. The middle fins are set quite wide and both inner and outer appear to have quite a bit of toe-in. The board is fitted with a Gore-Tex vent plug. The board was supplied with Simmer BlackTip and Mission fins but I'm running Makani Piranha's (Awesome Fins). A nice bit of tail rocker. Large double concave through the bottom. I ordered the board from the Windsurfing Shop who assured me that they could get the board in-stock in around 10 days directly from Simmer Sweden, It actually only took around 7 and that included clearing customs (They provide Fed-Ex tracking details so you know where it is every step of the way). An awesome deal was done so a big thanks to the Windsurfing Shop for looking after me and for providing excellent service along they way. I was so happy with the price and service I've ordered a second board that will be here very soon. Hopefully I'll get this one wet real soon...Stay tuned and I'll let you know how it goes. Very nice. I just bought a Goya Custom Quad 116 L as my light wind board. Very nearly went for the Simmer but I managed to find a deal on the Goya. I look forward to hearing how the Freegal 110 L sails, and whether I'll kick myself for not getting it. I had my first real wave session on the Freegal 110 yesterday in some gusty conditions, The wind was going anywhere from zero to about 20ish knots and quite off shore at times. To be honest when I first got the board I was worried about the width at 66cm thinking it was going to be a chore to turn.....WRONG, Way wrong was I. This board is something special and in that size perfect for the bigger sailors, It gets going easily and very reactive under the feet. The only thing I had to watch was diving the nose when taking off on the wave due to its 219cm length, I'm use to having to push the nose of the board down the wave face to get a good take off in the lighter winds...Not required anymore so I've just changed my technique a little and overcome my issue quickly. Must say the board loves rider input, If you just sit back and meander down the line you won't get the most out of this board. Push it hard...Real hard and you'll get to feel everything this board can really do. With the big wide nose it just loves to smack off the lip, The immediate change in direction is crazy...You think you've left your turn too late but it just whips you round and your ready to line up the next one. The stability while slogging is out standing...When tacking it feels like I've got a week to get from one side to the next, Fast tacks and gybes are also no issue. Like I mentioned the board comes with five fin boxes for total versatility, I ran it in twin mode (standard setup) and felt it was on the money, Good plaining, Upwind and turning...I'll play with the rest over time but I think it's perfect like that. This is going to be a fun boards for the summer here in Gerroa, I really can't wait get it out again. The fins have now moved from proto to full production, I've been running them for 2 seasons and really like how the work. 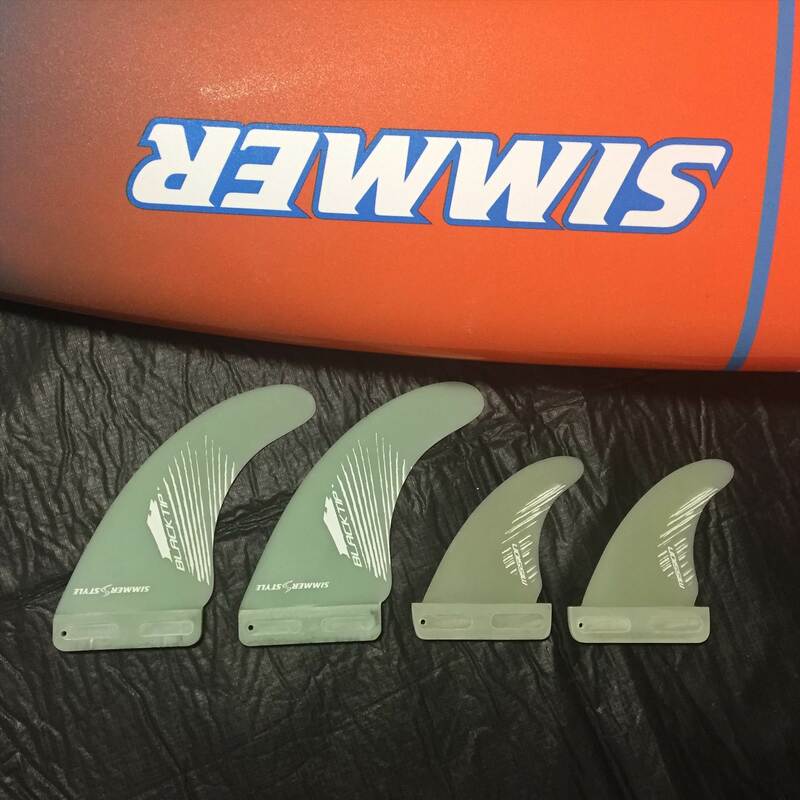 They are obviously very different to any fins I've ever used before and was like everyone else at first was put off by the massive serrated leading edge which would possibly do some damage...But probably no more then a normal fin chop, I no longer even think about the edge. Being a bigger rider and having to ride bigger boards then most (98-110) you find that these boards are a bit sluggish in the waves and lack the slash your looking for. This is where these fins come in...They just really loosen up the bigger boards with noticeable results from the get go. 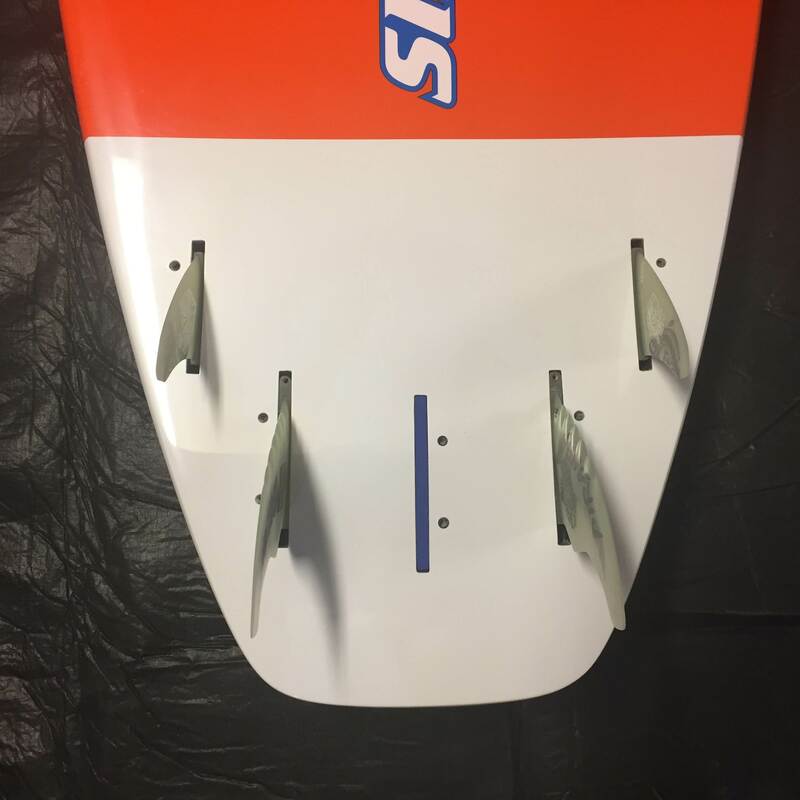 There's been report of excellent up wind abilities in the slalom fins, The wave fins are really good upwind but I really couldn't tell too much of a difference but I was running a size smaller then I normally would so maybe they are better. Obviously no good if you have a weed problem but that is to be expected...They aren't sharp so they won't just slice through everything if that's what your looking for. If your ever around Gerroa and want to give them a go I've got a few spare sets of proto versions in US and Slot Box to suit twins/Quad/Thrusters and singles that you can have a go with. Nice report. What size twins were you using and what size sail? I used 18 twin fins on my Goya 116 quad (with blanking plates for thrusters) yesterday and really liked that size fins on it. I'm using 16cm Makani fins and was on a 5.3 Simmer BlackTip. This really is a good read. As far as I know, I was the first person to receive a Simmer Freegal board and still have the semi-custom Freegal 100 proto. I think that it went into production unaltered, even if the most recent version most likely have received a few tweaks. It is, of course, designed by Ola Helenius, but I like to think that I had a little bit of influence in the origins of this board. At the time in 2013, I jumped back and forth between my FlyWave 85 and a Fanatic Skate 100. I had also sailed the Quantum 85. 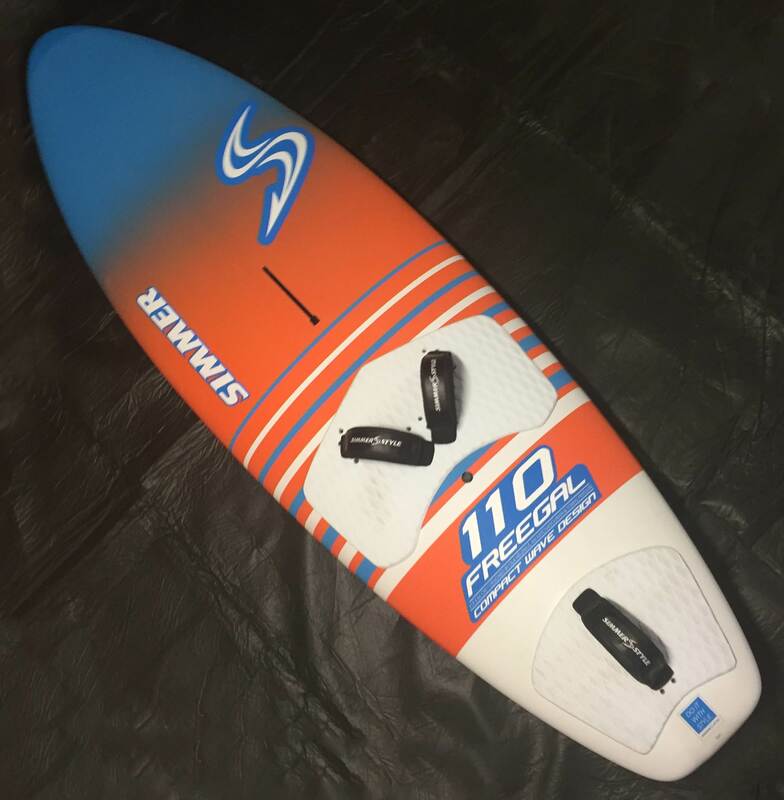 Somehow, I got the impression that maybe parts of the Skate 100 design could successfully be mixed with the Frugal 88 - introducing a faster rocker and slightly different rails into the compact Frugal outline to potentially create a very manoeuvrable big wave board in lighter winds. I was mainly looking for a board that would get going easily with not much power in the sail and a bit of push from the waves and give better mobility in the break in not-so-perfect conditions. It was of course also influenced by having seen similar 100-litreish compact shapes from other shapers, mainly custom though. Not least the Mark Stone and OES (Peter Ross?) designs. I had a (long...) mail chat with Ola about my idea and, to my delight, got the board delivered a few months later. To now read about this shape, albeit in the 110 version, being used in Gerroa south of Sydney (where I lived for a bit less than 6 months a long time ago) makes me smile a bit in front of my screen. Anyways, I have used my Freegal 100 in all kind of conditions an fin set-ups. Everything from flat water with a single fin, which actually works surprisingly well, to twin, tri and quad fins up to head high+ waves. In waves, I did find myself preferring it as a twin, since it gives the best mix of speed and turning ability in my book. 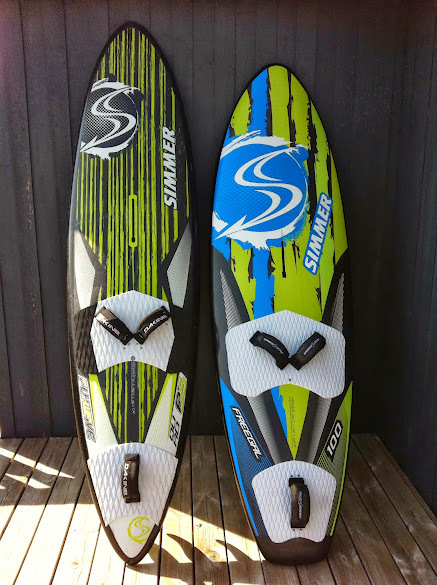 I think that it also benefits from the twin set-up, since I mainly use it in light wind wave sailing where the boards ability to quickly adapt and get into turns is much appreciated. Funnily enough, the twin fins that I have liked the most are 17 Makani fins (Walu 2, though) with a 5.3 BlackTip sail. It would be nice to read if you've had any more learnings about your Freegal 110 and how you set it up. It's a very fun board to ride in smaller waves but I do still find myself going for the Quantum 105 (Best board ever) when the waves are bigger. I've ridden the Freegal as a twin/thruster and quad, My preferred setup is quad with 16cm rears and really small 8cm fronts. If find this gives the best balance of speed and grip for me, It's fun as a twin in small waves but super loose and I find myself blowing out a lot of top turns (the 16s might be a tad small for the 110). I actually find the board can hold a drawn out bottom turn nicely, Maybe the finished production board is a bit wider enabling you to set the rail better? That said it loves to turn insanely tight, Vertical hits are so easy on this board. I still probably need to do some more work with the thruster setup as I'm sure it has its advantages...I think it would work nicely with a bigger sail in light winds for cruising around. Yeah, I would say that 16 twin is on the small side for the 110. I've used 16 a few times on the 100, but prefer 17 for a bit more grip and better upwind capability. Interesting on the quad setup, I have never tried it with any front fins smaller than 10 or 11. Will give it a go. Agree that it holds a drawn out bottom turn nicely, better than expected. To me, it is more about putting more pressure on the rail in faster waves when a longer rail/tail section gives you more to lean on, if that makes sense. Which is why a board like the Quantum performs better in bigger waves, I'd say. I find the same thing and use my more narrow 95-litre board when waves get bigger or faster. Hey jh2703 - Any thoughts on the 110 now you've had her a few months? Yep...A great board in the lighter conditions for me but I think a smaller 1 would be a whole lot of fun in good conditions. I do prefer the Quantum (it's my go to) as it's just the perfect board for me as far as float and performance are concerned. That said the Freegal has its place in my quiver though, on the really light days with a 5.9 it performs really good in the waves ...I mean really good. I've used it a lot on flat water also as a twin fin...Just for blasting around lake Illawarra and it's good. There was one day I gave the speed sailors a run for their money clocking almost 29 knots with a 5.9 ....the smallest they were running were 7.0 on their slalom boards and I was lucky enough to get the right gust and got them. I'm off to Peru and if I had the luxury of taking 2 boards I'd definitely be taking this 1, But I'm limited to 1 so the Quantum is it. It it is a fun board and really responds to rider input...Take it easy and it carves through turns like it's on rails but ride it like you stole it and it's a demon ...slipping and sliding all over the waves it's pure fun ...Like moto X on water. 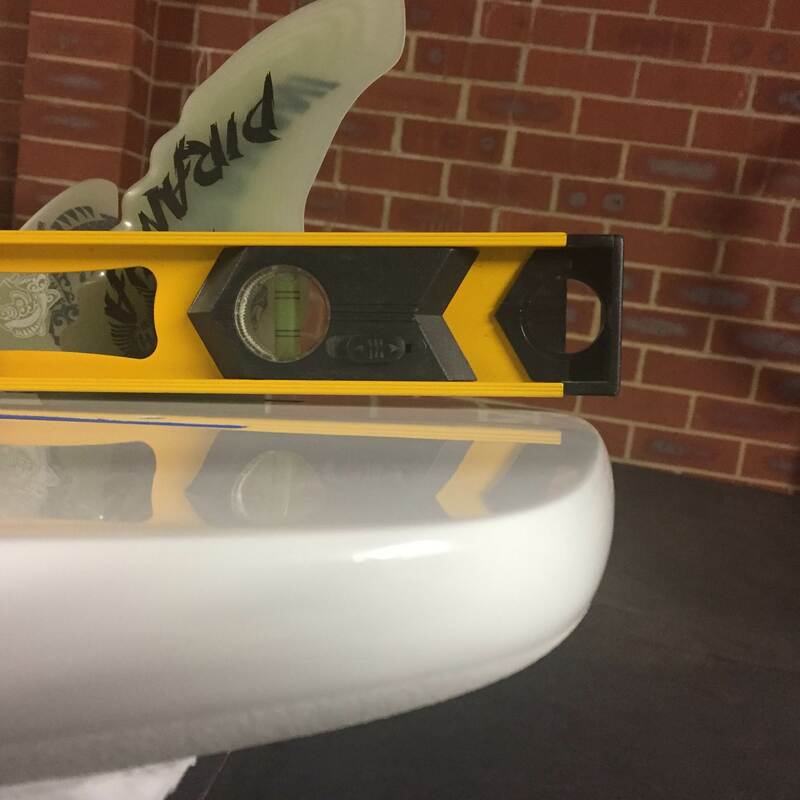 Hi jh2703 you tested this board with the Makani fins "This is where these fins come in...They just really loosen up the bigger boards with noticeable results from the get go." does this mean with the standard fins supplied the board would be less loose and not perform as well as when you tested it? Not real sure as I've not used the factory fins. I guess what I've found as a general rule with the bigger production wave boards is that the fins supplied are on the larger size...Great for blasting around but they make the board less responsive in the turns. I've used lots of big wave boards from OES, Quatro and now Simmer (100-127L). The thing I've found with big boards and what makes a real difference when it comes to performance DTL is getting the fin size right. Maybe I should try the standard fins but I just applied the findings of previous boards and fins to this one as well. The standard fins look good with a thin profile for limited drag and nice flexibility in the tips that should whip you round in the turns but they are bigger then what I personally think is needed for this board. I've been using Makani Fins to tune my boards for a long time now and I know what sizes work for me and the board sizes I have. They are great fins and the customer support awesome so I always get them for any new boards I get. Yeah ive got a couple of sets of makani fins for my quad boards, nice fins. For light wind and weedy water I've recently been using their quad weed fins 17 rears and 8 front a tad slower than the more upright fins and turns are marginally a bit more drawn out. In windy less weedy days I use 16 and 8. I tried 9cm and 10cm in the front but I think both those stiffened the board up. I reckon in quads theses a "magic" ratio of surface area between front and rears that works . I tried those black project fins too slow and draggy. Best fins ive ever used are the Choco fins but too hard to get, id like to try the pirhana. Sorry to hijack your thread about your board. Yep agree with the magic combo theory, There's a fine line between what make a quad feel loose and reactive and what makes it feel like it's stuck in the mud. As with you I like the 8s in the front and run 16s in the rear, When I run them as twins I go to the 17s. I think the Piranhas are something special as far as fins go, It may be because of the leading edge design that leads to a thinner foil profile hence less drag but they just seem to get up and going really fast. 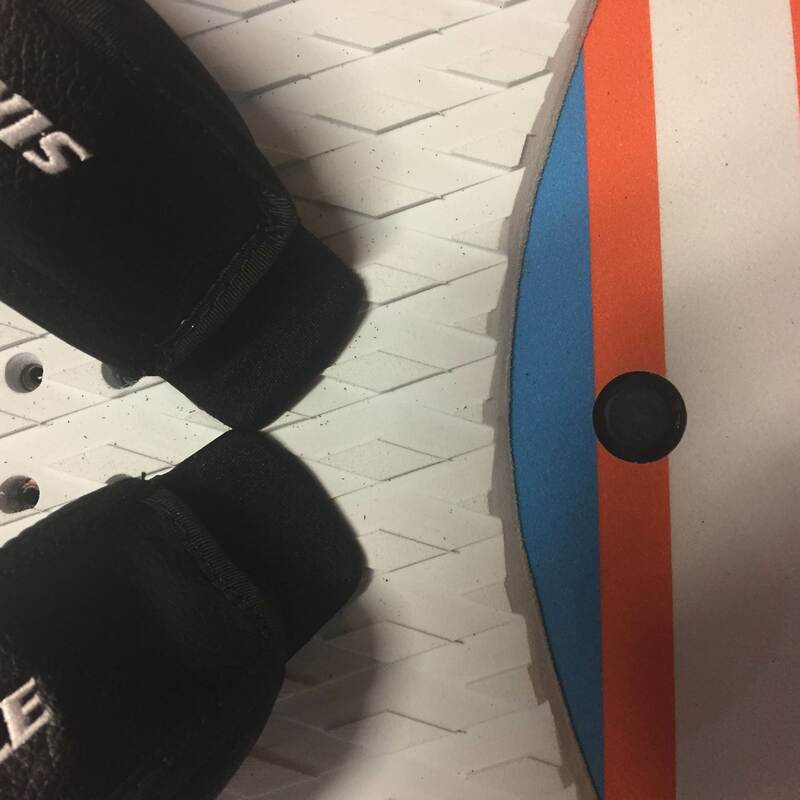 You get the stiffness in the base for drive but overall thinner thus reducing drag and the tips are very flexible allowing you to load them up in the turns with very forgivable but unique characteristics....Basically the perfect fin. I was wondering how the 2017 simmer boards held up aftet a year of use? Did you notice any difference between the build quality between them and boards built in the cobra factory? Other then a few paint scratches or scuff marks the boards are pretty much as new. The constitution is solid and you know that because they aren't the lightest (2017) boards on the market but that hasn't hindered the performance. My Quantum that travelled to Peru survived air travel, got dropped on the rocks, washed up on the rocks and got sailed into the reef fully planning with zero damage (other than fins). There's no compression marks from heals, Knees or mast strikes, They make one hell of a strong board. Just what I wanted to hear, They look the business and sound like they can take a pounding. I only just realised they had moved production to the kinetic factory, which seems to be a step ahead of cobra in terms of impact resistance and durability. 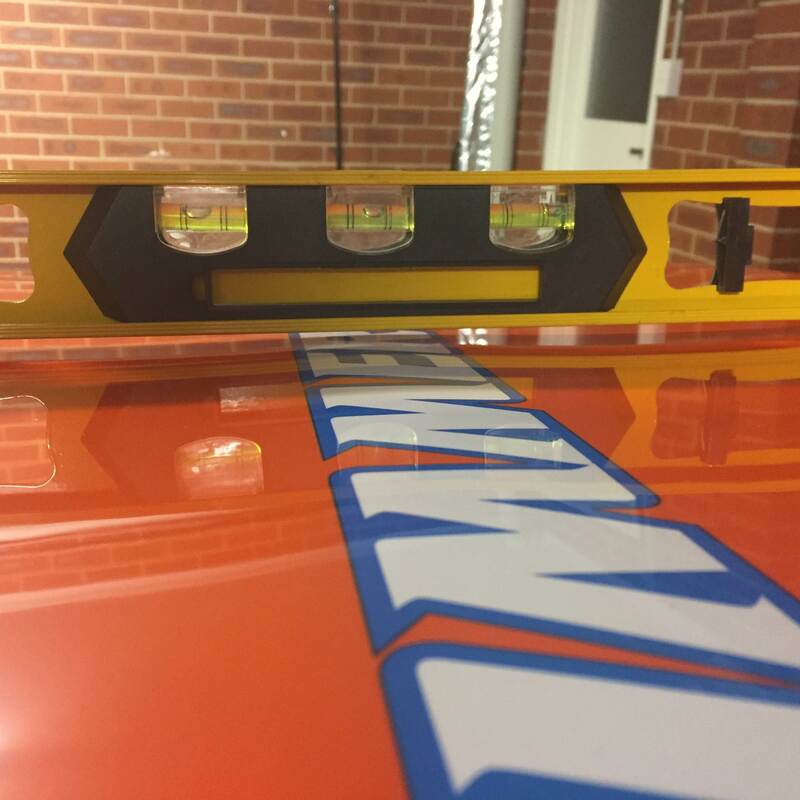 Your right the new 2018 boards have shaved a little bit of weight off and mostly to do with how they do the paint job. As most windsurfers I was a bit 'skeptical' towards the Simmer boards, when I started the Simmer Style WA here in Perth last year. Mostly because the boards where a little 'unknown' around here and it was all a bit 'new'. But after 16 months, I'm fully confident on the durability and how they hold up. This is from looking at my own boards + team riders and customers boards. From wave to full race boards. The new factory is doing a amazing job. Just a note on the Freegal boards. The new 2019 Quantum range has the sizes of 105 and added a new 115L, and this will cover the popular 'float & surf' 110L Freegal. The freegal sounds like a brilliant board, any idea why they aren't continuing them? I agree the Freegal has it's specific area where it is really good. I have a older 110L here that I tested a few times. In a 'float out & surf' 5.9 conditions (non planing), it was so much fun on the waves and turned surprisingly good. From a day sitting on the beach, this was a excellent choice to get out there and have fun. I have to be honest and mention when the wind picked up a little, it was quite slow to get on the plane, and not really that 'comfortable' to sail around, unless you where wave riding. Not sure for the other sizes of the Freegal, but I would very much only recommend it as a 'float & surf' board (for the bigger sizes). Some customers tested it as a freeride board / bump and jump and didn't really like the performance. But again take it on a wave in marginal conditions and it performs excellent, and you understand what this board is about. I guess the conditions where the Freegal works really good, is quite limited compared to the popular Quantum range that cover a lot more performance / range (also now with the added 115L). There is a lot of good feedback on the 115 and 105 Quantum boards for the heavier riders, or for a 'float & surf' board. I'm sure there is some other factors, like how many boards sold etc., and what the market wants + board ranges that might overlapping to much. Ola s designs are really good . The original Simmer factory was in China, poor quality control. Moved to VietNam and much improved. Last 2 years very good.